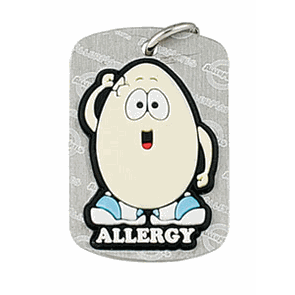 Egg Allergy Dog Tag with funky Eggie character that boys and girls love. 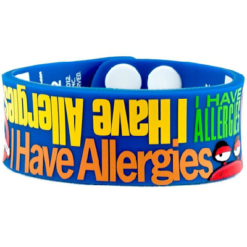 Even the Kids without allergies want them! It comes with a purple necklace cord made of stretchy silicone that is latex free. A unique closure make them easy to take on and off even for kids. The necklace is kids size (16 inches long).